When was Sydney Road established? Sydney Road was established with the arrival of Europeans, dividing the grassy plains between the now named Merri and Moonee Ponds Creeks in two, and disrupting the harmonious existence of the land and its inhabitants. First surveyed by Robert Hoddle in 1837, the crudely constructed road provided the boundary lines for the elongated allotments that flanked it. FACT: Originally named Brunswick Road, then Pentridge Road and finally Sydney Road in 1850. The road serviced the local farmers and residents as well as providing a route to the newly constructed Pentridge Stockade. With assistance from the prisoners, the poorly made road was improved but for nearly seventy years, its deplorable condition continued to arouse much controversy. 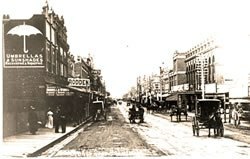 As the nineteenth century advanced, Sydney Road transformed itself from a rural road to a bustling urban streetscape. With the land booms of the mid 1800s and 1880s, hotels, shops, churches, council properties and houses replaced farms and open land. FACT: By 1879 the horse-drawn tram added to the road’s bustling atmosphere, and in 1887, Sydney Road entered the modern times with the arrival of the cable tram. With entrepreneurs seeking to capitalise on the road’s centrality and passing traffic, Sydney Road became the commercial spine of Brunswick. People flocked to its shops and businesses as the road became crowded with advertisements, window displays and hawkers. During Friday night trading, the road became a site for socialising and gossip as families went about procuring their weekly purchases. 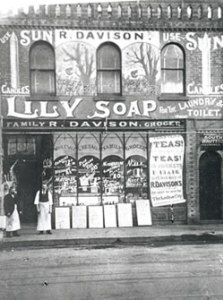 Sydney Road has been the scene for some bitter sectarian clashes. In 1896, some 40,000 Catholics assembled at the corner of Brunswick Road and Sydney Road to protest against the 1500 Orange men and women assembled to commemorate the annual Protestant Battle of the Boyne. What ensued was mayhem with the hurling of abuse, violence and arrests. 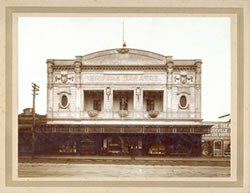 Thirty-one years later, the Catholics were again at the centre of controversy when thousands protested outside Sydney Road’s Empire Theatre over a film that they believed denigrated the Catholic faith. 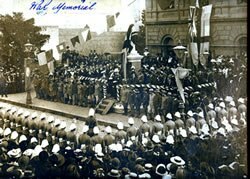 During World War One, Sydney Road became a site of commemoration and patriotism as people lined the road to cheer passing troops on their way to Broadmeadows military camp, frequent the businesses of returned soldiers, and assist in charity drives. It was also the site where people commemorated the dead, as private and public memorials dotted the road. During World War Two, the impact of the ‘brown out’ and the threat of imminent invasion were apparent within the streetscape as lights were extinguished and trenches dug. In the interwar years, the devastating impact of the Great Depression was evident on Sydney Road. Shops and businesses closed as profit margins plummeted, the Town Hall became a depot for the unemployed and impoverished and the road became a stage where people voiced their frustrations. Yet it was also the place where schemes were devised to better people’s lives and that of the community, from a ‘Made in Australia’ festival to the establishment of a local branch of the Communist Party. From the 1900s, Sydney Road was a space where people collectively asserted their political desires, allegiances and frustrations, whether it be the Communist or Socialist Parties, pacifism or the ultra-right Australian National Action. A tradition of Friday night speeches where orators would assemble on street corners and talk about politics, religion or anything else of interest was soon established. In 1933, the controversial free speech campaign culminated in Noel Counihan chaining himself inside a cage and delivering an illegal speech in front of a crowd of thousands on Sydney Road. From its formative years, Sydney Road has been ethnically diverse, with a myriad of cultures, religions and ethnicities. This has meant a great contribution of new businesses, foods, social venues and fashions into the community. Having weathered the cycle of boom and bust and the devastating impact of shopping centres, Sydney Road is now on the rise. The road has sought to retain its relevancy and economic potential with its council, businesses and traders’ association offering people more than just manufactured and controlled environments. Sydney Road is more than just a thoroughfare or commercial road, but also the cultural, political and social heartland of a community.